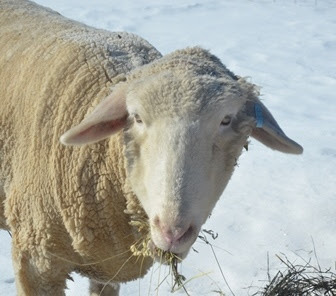 Shengifr, (pronounced Shengif, the “r” is silent- he was named by 2 year old grandson Jasper) is our bellwether. A bellwether was defined originally as a wether, a castrated male sheep that leads the flock, often wearing a bell so that the shepherd can find the sheep when they are out on pasture or in the mountains beyond sight. 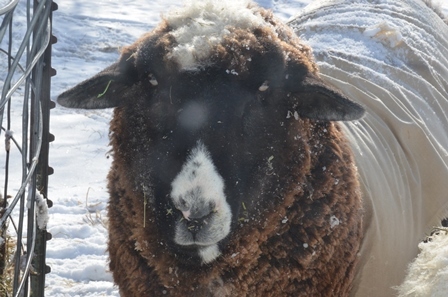 Shengifr is a wether, but he doesn’t actually lead our flock because he never gets a chance to hang out with the ewes. He keeps track of the rams – moderates their behavior, tags along where ever they go. The second definition for bellwether is a person who assumes leadership. Does that mean that our political leaders should be bellwethers? In 1980, musician and song writer Tom Paxton released a funny, protest record called The Paxton Report. One of the songs on that record, We All Sound the Same, spoofed political leaders. We'll be out there leading, about two or three steps behind you." Sound familiar? I thought it was hilarious when I was 32 years old and have continued to make disparaging remarks about political leaders who need to look at the polls before they speak or vote. Today, I wonder if we really do want our leaders to be to be followers rather than leaders. The third definition of bellwether is a person or thing that shows the existence or direction of a trend. Who are the bellwethers today? Are they Patrisse, Opal, and Alicia, the women who created the Black Lives Matter movement in 2013? Is it Brian Manley, the police Chief of the city of Austin, Texas, who said Austin police officers are not concerned about a person’s citizenship status and are instead “absolutely 100 percent focused on the safety of citizens.” Are they the hundreds of thousands of ordinary citizens who are protesting the ban on people from seven nations which are primarily Muslim, who already have Visas allowing them to enter the United States, from entering the country. Is it Standing Rock Elder Brave Bull Allard who established a camp as a center for cultural preservation and spiritual resistance to the Dakota Access Pipeline. He gave people a space and a chance to consider the pipeline as a threat to the region’s clean water and to ancient burial grounds. Who is the bellwether? Is it an individual? A political system? An organization? A movement? The real bellwether in our flock is not a wether nor does she wear a bell. Waffle, a two year old ewe, was tamed by friends Budd and his daughter Kate. Waffle knows that good food comes from people and she eagerly greets each person entering the pasture. That means that people who visit the farm are charmed. Also, when Waffle rushes toward people, she draws the rest of the flock behind her into a new pasture or into the barn. Both of those traits make her a valuable resource for our farm.